We’d love your help. Let us know what’s wrong with this preview of The Littlest Bunny by Lily Jacobs. It's Easter morning, and the littlest bunny has a big secret: he's actually the Easter Bunny! He has a lot of work to do! Join him as he hides eggs high and low, with a final stop at your house! To ask other readers questions about The Littlest Bunny, please sign up. Flop is adopted by a new family the day before Easter, but he has a big secret. He's the Easter bunny! Flop must complete all his Easter duties and get back to his new family before they notice he's missing. This story is told in rhyme and flows nicely. I got the book that is customized for North Carolina, since I live there. There is special artwork and text that changes depending on which state or city the book is featuring. Hidden Easter eggs throughout the book engage kids as they find and co Flop is adopted by a new family the day before Easter, but he has a big secret. He's the Easter bunny! Flop must complete all his Easter duties and get back to his new family before they notice he's missing. This story is told in rhyme and flows nicely. I got the book that is customized for North Carolina, since I live there. There is special artwork and text that changes depending on which state or city the book is featuring. 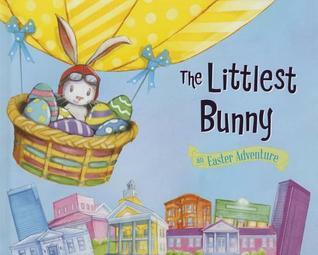 Hidden Easter eggs throughout the book engage kids as they find and count them. This customization is available for all 50 states and several Canadian cities, so you can pick the story featuring your home. This is a fun book to read, and the illustrations are adorable, too.